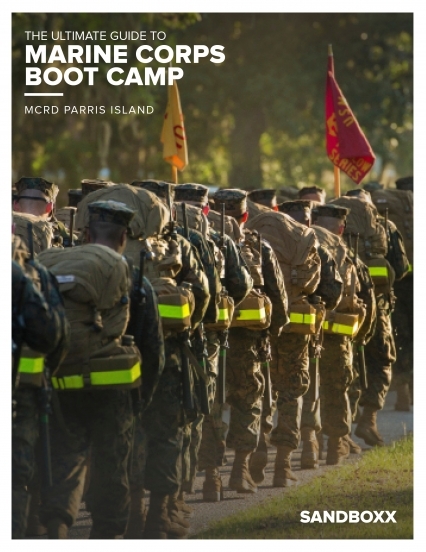 Get the complete guide to Marine Corps boot camp at MCRD Parris Island. This guide will provide you with all things related to Marine Corps boot camp from when your recruit steps off the bus and onto the yellow foot prints, until they graduate and earn the title of United States Marine. Get a break down of each of the four phases of Marine Corps boot camp with main events highlighted. Get Letter topics that relate to your recruit's training schedule, so you can send support when they need it most. Keep track and countdown the days to graduation with our boot camp calendar. Learn about Marine Corps history and traditions similar to what your recruit will be learning through out boot camp. "Yeps....when it comes to communicating with your military loved one, snail mail is a thing of the past. Your love will will eventually get your letter...but you will not get one back! Sandboxx makes it so very easy for a return correspondence. My non-writing Marine sent a letter back to EVERYONE who wrote him in boot camp! OohRahh and Semper Fi! Many thanks SB!" Developed by veterans with decades of service, Sandboxx delivers the ease of connection. With Sandboxx, service members and their loved ones can stay in touch, no matter how far apart they may be. Digitizing the time-consuming processes of sending physical Letters and simplifying the booking of military-related travel, Sandboxx empowers service members to maintain meaningful bonds with family and friends back home. © 2018 Sandboxx All Rights Reserved.